Related: Installing LED gauge bulbs on your 3rd gen Magna! Note: This article was originally posted to this website around March 16th, 2003. The above post date of this article reflects when it was added back after a major update to this website. Update August 2012: While reviewing this page and checking my link to Signal Dynamics, I discovered that they now make a headlight modulator with custom harnesses (“Plug & Play”) that allows you to install a headlight modulator without cutting or splicing any wires. Pretty cool! The instructions here will still be useful but the installation has been greatly simplified. Update October 2018: I’ve had these installed for 15 years now and mostly due to the headlight modulator, I firmly believe that I am seen more easily. I also upgraded to the newer headlight modulator (mentioned above) and am happy with the results. It is very user-friendly. At some point I may alter the instructions here to bring it up to date with the newer version of these modulators. When it comes to riding a motorcycle, I believe that you can never be too safe. One of the most important elements of riding a motorcycle is being sure that other drivers see you. There are many ways to make your presence on the road more obvious, and one of them is to have modulated (pulsing or flashing) headlights and brake lights. 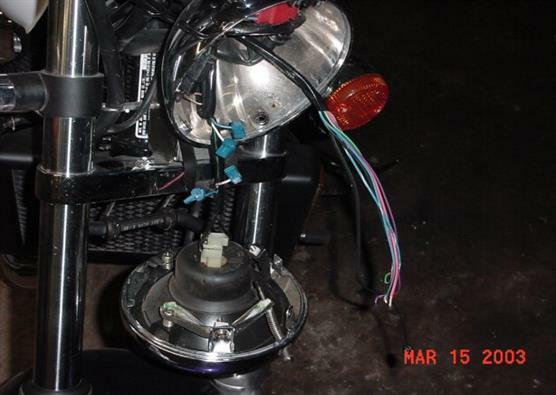 This page documents the installation of these items on a 1996 VF750CD Honda Magna Deluxe (without the stock bikini fairing, essentially making it a VF750C Magna for the purposes of this article). You can read more about these accessories as well as purchase them by visiting the Signal Dynamics website, the company that makes them. The items I installed are the Back Off Brake Light Signal Module and the Diamond Star Headlight Modulator (with remote switch). Both are relatively easy to install, but the Headlight Modulator is a bit more time consuming. It took me approximately two hours to install both units, although following the directions on this page, you can probably get the job done a bit quicker, since I have already done the work of locating the correct wires and locations for you. The directions on this page closely follow the directions that come with the units, but I have changed some wording and ordering to make things go easier for you. All wiring instructions are exactly the same as the original documentation states. The instructions for the Headlight Modulator recommend that you disconnect your battery, but so long as you leave your ignition OFF (except when you need to test wires), you are in no danger of shorting anything. If you feel more comfortable disconnecting the battery, that is fine too, it will just take a little longer to complete the installation. A word of caution: I installed these items back in 2003. While the wire colors in your 1996-ish Magna are likely to be the same, I have no way of knowing if the wire colors are still the same on the latest modulators manufactured by Signal Dynamics. I would recommend that you double-check the installation instructions to be sure you have the correct wire coming from the modulator when doing each step. Before you get started, you should ensure that your brake light works, as well as your low & high beam headlights. If they do not work correctly, you should fix them before attempting to install these items. Step 2: Locate the wire harness behind the battery and bend the black strap away from the harness cover to gain access to the wires in the harness. Disconnect the green wire with the yellow stripe as shown in the picture at right (it simply pulls apart). It is bundled together with another green wire and a brown wire. 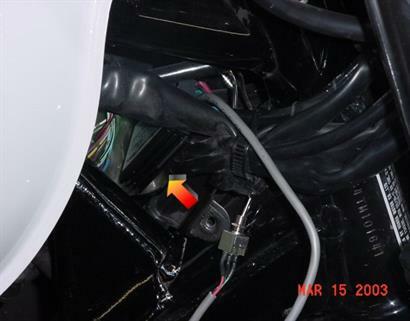 This green wire with the yellow stripe is the “positive” brake wire. To confirm that you have the correct wire, try pressing the brake (either one) with the ignition turned on. If you have the correct wire disconnected, the brake light will not light up. Note though, that the taillight will still remain lit. Step 3: Turn off your ignition if you turned it on in the previous step. Carefully cut or tear away some of the tape holding the wires together to expose more of the wire you need to work with (green with yellow stripe). Step 4: Cut the brake wire approximately two inches past the ”plug connector” at the end of the wire. Step 5: Strip 1/4 inch of insulation off of the ends of each piece of brake wire and attach barrel connectors (not included with kit) to each piece. If you do not have barrel connectors, you can bypass them and simply twist the wires together and wrap them with electrical tape in the next two steps. 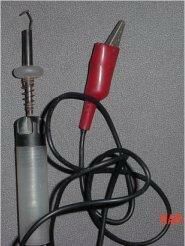 If you have a soldering gun, even better! Step 6: Connect the RED wire from the BACK OFF MODULE to the short piece of wire with the “plug connector” at the end coming from the brake switches. Step 7: Connect the WHITE (with red stripe) wire from the BACK OFF MODULE to the wire coming out of the taped wires going to the brake light. Step 8: Plug the “plug connector” back into the female connector as it was before. It may take some force, but be sure it is fully seated. You should feel it snap into place. Step 9: Attach the included adhesive tape to the back of the BACK OFF MODULE, and secure it behind the plastic cover surrounding the factory connectors. Be sure to get it as far down as possible, to prevent the seat from putting pressure on it. Then bend the black strap back down over the harness to secure it. Step 10: Turn on your ignition and press and hold either brake. The brake light should flash three times, then go steady for approximately 3.5 seconds, then cycle again. If it does not, check your wiring and try again. Note that it may behave differently if the modulator has been slightly changed since I installed mine (or if you are installing a different model.) To confirm that it is working correctly, see the documentation that came with yours. That’s it! 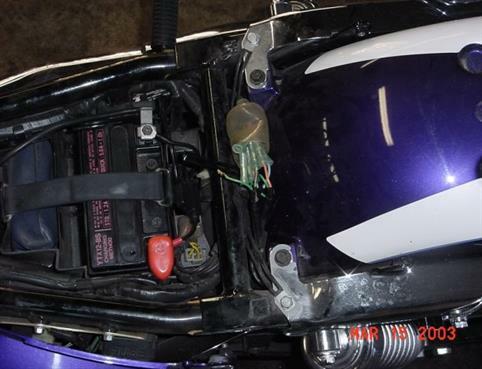 If you plan on disconnecting/ connecting the battery while installing the Headlight Modulator, leave the seat off so you can access it. Otherwise, you can put the seat back on, because you no longer need to access anything underneath it. NOTE: While every effort was made to help you identify the correct wires for the installation of this product, it is recommended that you double-check them with a test light. For this installation, I recommend the type that allows you to pierce the wire without having to do any cutting (see picture). If you don’t have this type of tester, you can usually find ways to do it with a conventional test light or meter, by probing the connector at the end of the wire in question. If you do not own a test light or meter, you could probably get away without using one, so long as you are sure you have the correct wire. What you will need: Philips screwdriver, wire cutters & strippers, drill, 1/4” drill bit, 5/16” drill bit, pliers or channel-locks, electrical tape, razor blade or utility knife. What you may also find useful: You may need a socket & ratchet to remove the headlight housing, which will make it easier to mount the light sensor from the modulator. 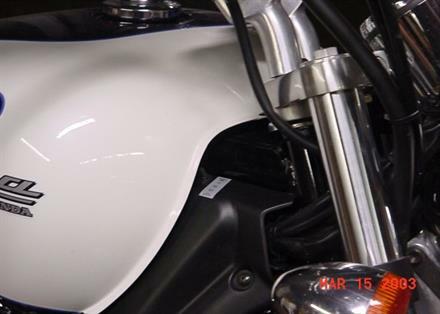 Step 1: After looking at the routing of the factory wiring, I determined that the best way to install the Headlight Modulator was through the plastic access cover on the right side of the bike. This will also allow you to run wires right next to the factory wires, helping to hide them. It is held in place by one philips screw. Remove the screw and the panel. Incidentally, if you are using a test light, I found that a good place to clip the ground wire is to the hole where this screw goes in. See picture below right. Step 2: Remove the front headlight assembly from the headlight housing by removing the two recessed screws (do not attempt to remove the adjustment screws that stick out further!). Once the screws are removed, the headlight can be pulled out. There is a tab at the top that holds it in place, so it may take some careful wriggling to get it out. Essentially you need to hold the bottom out a bit while pulling down on the headlight. Be patient, and careful! See picture. Step 3: Wrap all of the wires from the Headlight Modulator (EXCEPT for the wires going to the remote switch) with electrical tape. You can leave the last 6 or 7 inches unwrapped, as you will be cutting them shorter anyway. The tape is to help make the wires less obvious, as well as protect them. Alternatively, you could use a wire loom or similar item, if you have one. Step 4: Feed the taped wires through the hole at the back of the headlight housing, following the factory wires that go through it. Next, place the module itself into the open space behind the panel you removed earlier. I found this to be a safe place to put it, and you don’t even need to secure it with the supplied adhesive mounting tape. Using a couple of the provided zip-ties, attach the modulator wires to one of the wire harnesses going to the headlight to make it look more “factory”. Step 5: Carefully cut away the black sheathing covering the wires going to the headlight. Inside it, you will find three wires. The WHITE wire is the “low beam” wire, the BLUE wire is the “high beam” wire, and the remaining wire is the ground. Step 6: Cut the WHITE headlight wire, then attach a blue T-Tap connector to each end of the cut wire, using channel locks or pliers. I recommend clamping it on the wire so that the edge of the T-Tap connector sticks out a bit further than the wire itself. This will help to prevent the exposed end of the wire from shorting on metal while inside the headlight housing. Step 7: Repeat the above step with the BLUE headlight wire. NOTE: In the following wiring steps, you should cut the wires coming from the modulator a little shorter before hooking them up. This will reduce the extra clutter of longer wires being inside the headlight housing. Using your judgment, simply cut them so that they are a little longer than needed to make the connections, but will allow them to be tucked back into the housing when finished. I do NOT recommend cutting the wires going to the photo-optic sensor though. The wires from the modulator get fed through the hole in the back of the headlight housing. You can also see the T-Taps clamped onto the low & high beam wires. Step 8: (high beam installation) Strip 1/4” of the insulation from the SOLID RED WIRE from the modulator and crimp a “light blue male disconnect terminal” onto it. Repeat this process for the RED & WHITE STRIPED WIRE from the modulator. 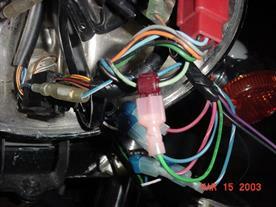 Plug the SOLID RED WIRE into the T-TAP attached to the BLUE wire coming from the headlight switch. 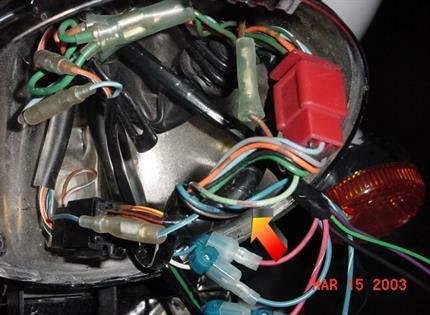 Plug the RED & WHITE STRIPED wire into the T-TAP attached to the BLUE wire going to the headlight. Step 9: (low beam installation) Strip 1/4” of the insulation from the SOLID BLUE WIRE from the modulator and crimp a “light blue male disconnect terminal” onto it. Repeat this process for the BLUE & WHITE STRIPED WIRE from the modulator. 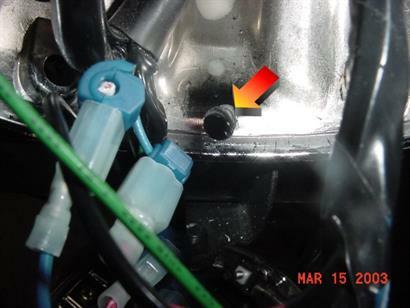 Plug the SOLID BLUE WIRE into the T-TAP attached to the WHITE wire coming from the headlight switch. Plug the BLUE & WHITE STRIPED wire into the T-TAP attached to the WHITE wire going to the headlight. Step 10: (“Heads-Up” installation – horn wire) The horn wire runs through the red connector located near the top-right of the headlight housing. The wire you need is LIGHT GREEN with small RED dashes running along it (see picture at right). Pull it away from the other wires to gain better access to it. DO NOT CUT THIS WIRE. Clamp the ”Maroon T-Tap Connector” onto the horn wire. Strip 1/4” insulation from the end of the GREEN wire coming from the modulator and crimp the “pink male disconnect terminal” onto it. 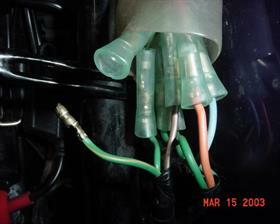 Plug this GREEN WIRE into the T-TAP you just attached to the horn wire. The horn wire runs through the red connector. The wire itself is light green with a red stripe on it. 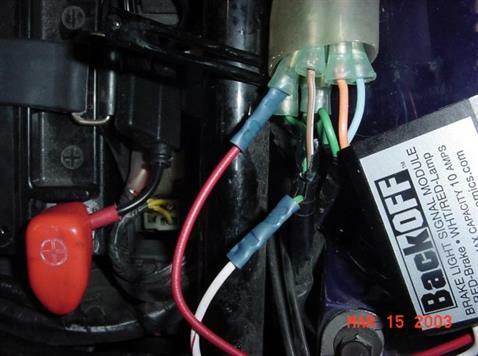 Step 11: (Ground wire) Using the supplied “dark blue, quick splice connector”, attach the BLACK wire coming from the modulator to the remaining third wire (GREEN) that goes to the headlight. DO NOT CUT THIS GREEN HEADLIGHT WIRE. After this, there should be two wires left coming from the modulator: a double-black wire and a PURPLE wire. 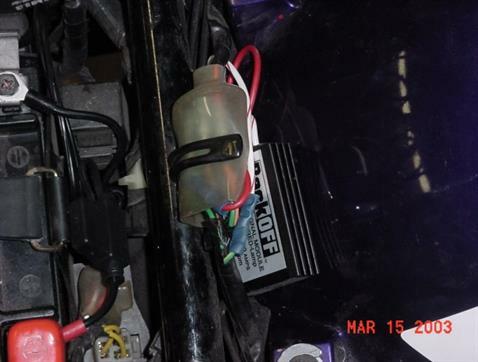 The PURPLE wire is for horns that use a ground signal to sound the horn (as opposed to a positive signal), and is not needed to install this modulator on your Magna. Simply cut it a little shorter then wrap the end with electrical tape. As for that double-black wire, that is the photo-optic (light) sensor, and we will get to that next. Important: If you have already installed (or plan to install) a “light bar”, or if you have a fairing that wraps under the headlight, you may want to choose a different location for the photo-optic sensor than what I am going to recommend. I say this because a light bar may hinder the sensor’s ability to sense the ambient light correctly (I don’t know because I do not have one installed). If it appears that it will not cause a problem, then by all means, go ahead and follow my directions (let me know if it DOES work). Otherwise, find another location, by following the recommendations found in the Modulator’s instructions. A fairing that wraps under the headlight will DEFINITELY cause a problem! 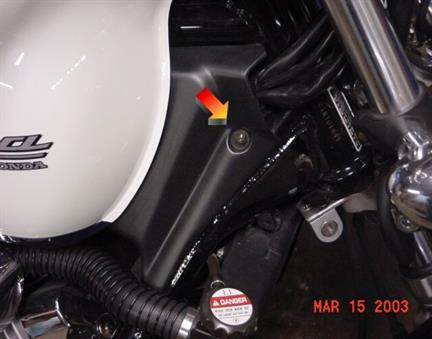 If you have one, then I recommend mounting the sensor into the bottom of the fairing. Step 12: (Photo-Optic Sensor) Using a 5/16” drill bit, drill a hole into the bottom of the headlight housing. If you feel under the housing, you will notice a raised area. 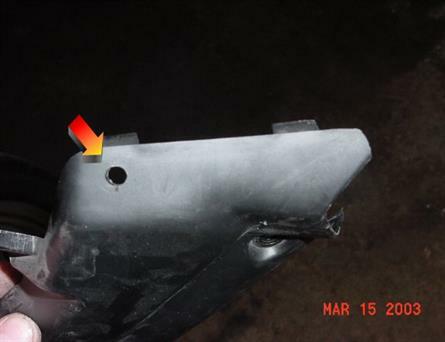 Try to keep the edge of the hole away from this area, but do not drill it too close to the edge of the housing, otherwise the headlight may not seat correctly when you reinstall it. The picture at right shows the ideal location pretty well. All wires are now connected, aside from the photo- optic sensor wire, which can be seen hanging down on at the bottom right. Step 13: (Photo-Optic Sensor – continued) Remove the nut from the sensor and put it through the hole so that the sensor “eye” is facing down. Next, thread the nut onto the sensor and tighten with channel locks or a socket. Make it snug, but because the sensor is plastic, do not over-tighten it. NOTE: I found it much easier to do this by removing the headlight housing from the bike first. 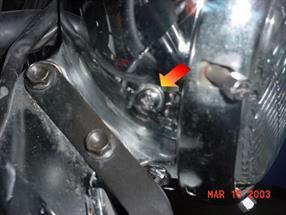 Those bolts can be seen in the small picture from Step 2. If you remove the housing, be sure to reattach it before proceeding to the next step. Step 14: Tuck the wires back into the headlight housing. You will notice by looking at the headlight that the center of the housing needs to be “open” so that the headlight will fit back into place. Keeping this in mind, cram the wires so that the center of the housing remains open. Once you get the wires crammed in, replace the headlight and attach the retaining screws that hold it in. Step 15: You’re almost done. 🙂 Next we will mount the toggle switch that controls the modulator. The most obvious location is somewhere in the panel that we removed in step 1. I chose to install it in such a location that it is somewhat hidden, and cannot easily be bumped. 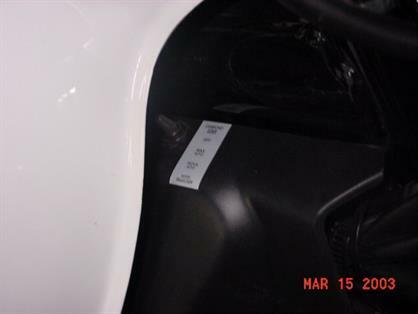 The location I chose puts the switch under the front edge of the fuel tank. It is relatively hidden, and is still easy to get to. You will need a 1/4” drill bit to drill the hole. At right, you can see a picture showing where I drilled mine. Step 16: Install the toggle switch so that the “green wire” is towards the back edge of the panel. This is the “off” side of the switch, and it corresponds to the positions marked on the provided sticker. Once the switch is installed, place the sticker to the right of the switch. This sticker will be visible in this position. If you do not want it to be visible, then you may want to put it somewhere less obvious. Hole for toggle switch. In this position it will be slightly hidden behind the tank but still accessible. Step 18: Test it out! If it is light outside, then it should be easy to test. Otherwise, you may need to use a flashlight aimed at the sensor in order to test it. See the instructions that came with the modulator for details on how the modulator works with the different switch settings. LAST STEP: IMPORTANT… Because you removed the headlight, you might want to check to make sure that it is still aimed correctly. With the extra wires behind it, it may cause the aim to change. You can find many articles on the internet about how to aim your headlight (and they are almost all different… go figure! ), so pick one that sounds good and check your aim before taking your bike out on the road! I hope this helped you out! If you have any questions or comments, please feel free to contact me. 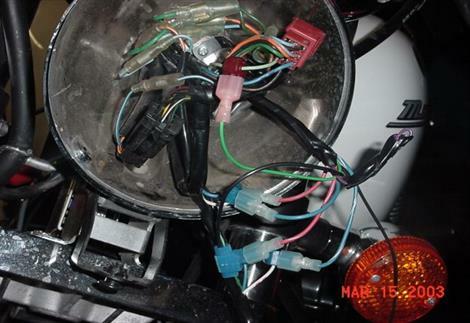 As stated at the beginning of this page, I do feel that adding these devices to my motorcycle have made a difference in people seeing me, especially the headlight modulator. I don’t think I would ever own a motorcycle without one.